Art is often a creative way to present a concept of reality. So much so that every once in a while, it blends the two so well that you&apos;re not even sure where it the art begins and reality ends. The first time I saw the Thirst tree, the blurred lines created a stunning effect. I was on Austin&apos;s famous hike and bike trail taking in all of the natural beauty when I suddenly encountered the barren silhouette of the stark, white tree. The effect that this installation provides the viewer can be very contradictory. 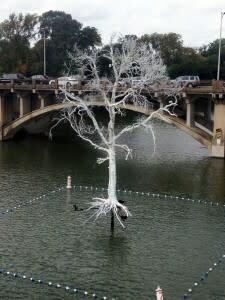 Upon first glance, it&apos;s obvious that the tree is dying, yet it is perfectly perched in the middle of the Lady Bird Lake giving the illusion that it is surrounded by vast sustenance. However, closer examination reveals that roots are far above the water. This project commissioned by Women and Their Work, provides both a visual and experiential concentration on the scarcity water and its direct correlation to life. THIRST is comprised of two components: a 35-foot dead cedar elm tree painted white that floats over the lakes surface, and 14,000 prayer flags that pay homage and reverence to the tree in the center. Both works commemorate the trees that died in the 2011 Texas drought. In a somewhat ironic twist of fate, the installation was partially damaged in the floods a couple of weeks ago. The organizing entity is currently running a fundraising campaign to help raise funds to repair the damage. THIRST will be on view through December 16, 2014.